Book Laurence Kemball-Cook as a keynote speaker. 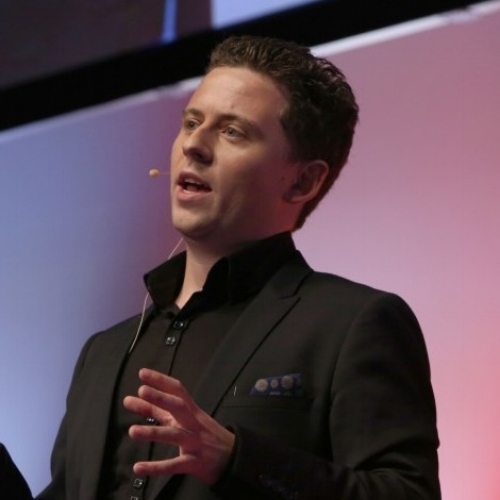 Laurence is the Founder and CEO of Pavegen. Headquartered in London with an R&D centre in Cambridge, Pavegen manufactures an award-winning flooring that instantly converts kinetic energy from footfall into off-grid electricity and data. Laurence is the Founder and CEO of Pavegen. Headquartered in London with an R&D centre in Cambridge, Pavegen manufactures an award-winning flooring that instantly converts kinetic energy from footfall into off-grid electricity and data. Laurence launched the business in 2009, having graduated with 1st class honours in Industrial Design and Technology from Loughborough University. He filed the first patents from his bedroom with £200. Since then, Pavegen has scaled across the world, installing more than 200 permanent and experiential projects in 30 countries. Cola, Formula E, Heathrow, Samsung and Shell. Recent highlights include creating the world's largest energy harvesting floor with Google to launch the company's new flagship smartphone in Berlin. and global innovator Will.I.Am . Laurence's entrepreneurial savvy and technical knowledge continue to attract global media coverage. Recent articles include pieces by the BBC, CNN, Financial Times, Forbes, Huffington Post, The Times, Wall Street Journal, Washington Post and Wired. The Daily Telegraph describes him as a boy genius. Through his extraordinary vision and energy, Laurence has established himself as one of the world's most exciting disruptors, thought-leaders and communicators on clean tech and entrepreneurship. His speeches are shot through with passion and optimism. He has recently delivered talks in Las Vegas, at the RSA, the latest London Tech Week and GITEX - Dubai's leading technology event. He has also spoken at TED events in Germany, Brazil, USA and the UK, as well as for organisations such as the UK Government's Department for International Trade.